We’re getting to that glorious time of year when one does not need a recipe, because the ingredients speak for themselves, and they insist upon little more than olive oil, garlic, a sprinkle of chilies, the smallest squish of lemon, and a poached egg. Asparagus has just begun to appear; soon, fiddleheads will beg for the same treatment, and then later on, so will green beans. 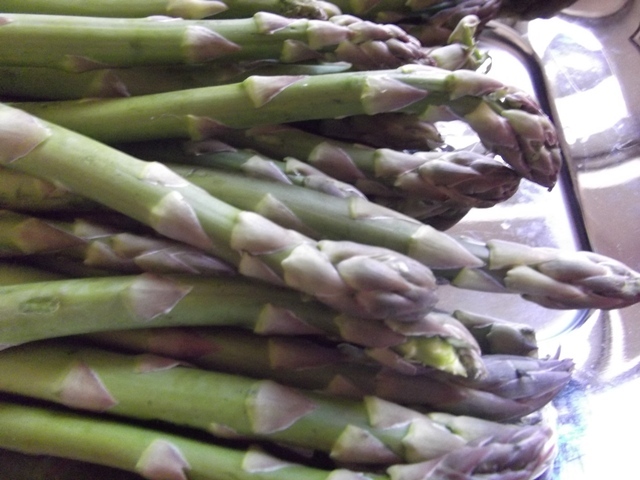 A pound of asparagus, or one large bunch, will make enough for dinner for two. There are no drawbacks to allowing your vegetables to insist in this way, because it is an almost instant meal – 15 minutes, maybe, depending on how long it takes your water to boil. You will boil your asparagus in salted water for three minutes, and then you will pull them out of the water and drop them into a hot pan already sizzling with olive oil, garlic, chili peppers, and the zest of half a lemon. Toss your asparagus in the hot oil, 30 seconds, and then squish half a lemon over the whole thing. 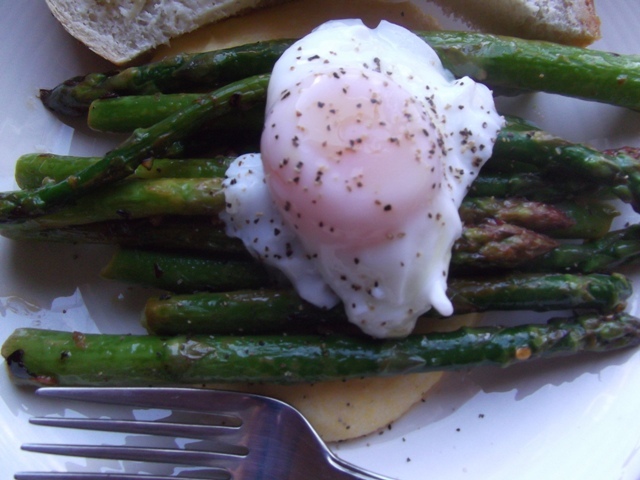 Serve with polenta and a poached egg. Chewy, crusty bread on the side with a generous smear of butter will tie the whole thing together beautifully. And you will feel at ease upon sitting down to this, because it is the unfussy food of spring, and it is time for it at last. < Previous Wordless Wednesday: This is why we can’t have nice things, Cat. I agree. After a long winter, spring veggies don’t need much to be fabulous! Beautiful photos. I can almost taste the egg yolk. Karen: And it has been a long winter! So good to have crisp fresh veggies again! Rufus: Thank you! Those eggs come from happy chickens who live not too far away. I LOVE your blog!! Thanks for posting! I got inspired by your Asparagus Post, so I made up my own Breakfast Lasagna! Here it is! 1) Half the potato (length wise), then slice the potato so that it’s about 1/2 cm wide. Pan fry in 1/2 tsp of vegetable oil. Season with salt & pepper. 2) Wash both Asparagus & Mushrooms. Chop Asparagus into 1/2 inch pieces, slice mushrooms into thin slices. 3) Once the potatoes are done (brown edges and fork tender), place them in a medium size bowl. That will be the base of the lasagna. Add half of the cheese. Let it melt. 4) Pan fry the asparagus & mushroom, season with a little bit of salt & pepper (I used some Citrus Salt! ), when the mixture is almost done, add in spinach. Once the spinach has all wilted, put it on top of the potatoes & cheese. Add the rest of the cheese on top of the veggie mixture. 5) Lastly, break the two eggs and cook them as you like it! (I made the eggs over easy). Once the eggs are cooked, use them as your last layer of the lasagna. Mandart – Oh wow! This sounds awesome. I will attempt this for sure, it sounds really good. 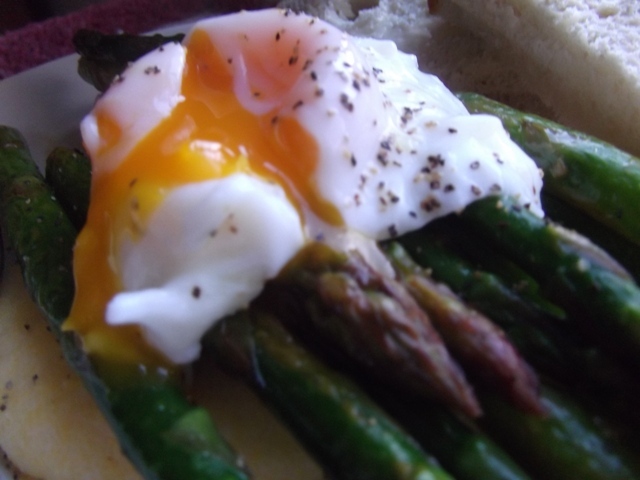 Though perhaps more involved than my regular weekday breakfast – maybe something for a weekend. Cool idea! Thanks!